Sweet and savory morning treats Wi-Fi access and a stellar spot near the airport and shopping top the list of amenities at La Quinta Inn & Suites Fort Smith. Waffles cereals and more are free every morning at this three-story La Quinta Inn. When not getting down to business in the work center or pumping up some cardio in the gym guests can kick back with free high-speed internet access coffeemakers microwaves and cable TV featured in all 71 rooms. The hotel also provides a seasonal outdoor pool free parking and guest laundry facilities. The hotel is within a half-mile of I-540 and one block from St. Edward Mercy Medical Center. A 10-minute ride northwest leads to Fort Smith Convention Center located in the heart of downtown. When tee time is on the menu guests can head five minutes west to Hardscrabble Golf Course. 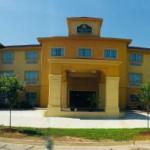 The hotel is also five minutes from Central Mall and one mile from Fort Smith Regional Airport. Dogs are allowed for no additional pet fee; there is a pet policy to sign at check-in. There can be 2 dogs up to 40 pound each or only 1 dog if over 40 pounds per room. Dogs may not be left alone in the room.